With Performance Friction’s two-piece floating Direct Drive and Direct Drive ‘V2’ disc assemblies, the disc flange floats in the bobbin structure, allowing radial and axial expansion of the disc without being constrained by the hub or hat. 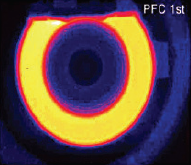 Years of R&D and thousands of race miles have resulted in the development of PFC’s Patented Direct Drive Systems. Direct Drive uses a saddle bobbin as part of the mounting system. Direct Drive V2 is an integral drive in hat system and is the latest generation disc mounting system designed to enhance the Z-Rated Big Brake kits by reducing the number of components and overall disc assembly weight. A true two-piece floating race disc optimised for road and track duty. • Reduced thermal distortion and warping. • No rattling – 100% silent operation. • Reduced drag and increased mileage. 1. High Carbon Alloy with copper and molybdenum for high temperature strength and durability. 2. Vanes turned OD and ID for balance to reduce thermal warping and vibration. 3. Run-out less than .001 inches, reducing pulsation and vibration. 4. Thickness variation less than .0003 inches reduces vibration. 5. 47 or more vanes for superior thermal capacity. 6. 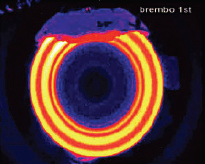 Aircraft quality heat-treated for microstructure alignment and durability. 7. Surface finishes less than .7 microns. 8. 100% measured and inspected to meet tolerance specifications. 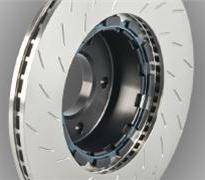 PFC Brakes outperform the competition by more efficiently distributing heat for lower lap times, longer life and improved driver control.